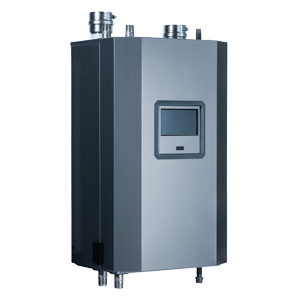 Condensing downfire stainless steel gas boiler. Trinity Fire Tube (Tft) heat exchanger is ASME certified and uses an innovative down-fired concept. The tubes have a dimpled design to optimize heat transfer, which increases energy efficiency. The Fire Tubes provide generous space for flue gas to pass, and significantly reduce the need for cleaning due to the vertical configuration and self-cleaning operation when in condensation mode. Stainless steel design The ASME certified heat exchanger is constructed using 439 stainless steel, making it extremely resistant to corrosion. The Fire Tube design allows water to flow freely around the heating surfaces of the boiler, which significantly reduces pressure drop. AFUE efficiencies up to 95% NTI was the first to develop the totally-sealed combustion system, whereby air is not drawn from the cabinet. Sola ControllerThe intuitive touchscreen makes for easy set-up, often taking less than a minute. Color coding alerts users to problems and common language makes for easy troubleshooting. Flexible Ventingvent runs up to 150 feet, five vent termination options, 2" venting on some models and plumbing and gas connections at either top or bottom.